In the Greek epic poem the Odyssey, the hero Odysseus devised a clever ruse to escape from the man-eating, one-eyed giant Cyclops. First, Odysseus blinded the monster, then tied himself and his men to the undersides of the sheep in the giant's flock. The blinded Cyclops checked his sheep as he let them out to graze, but he only felt along their backs, so Odysseus and his men were able to escape. 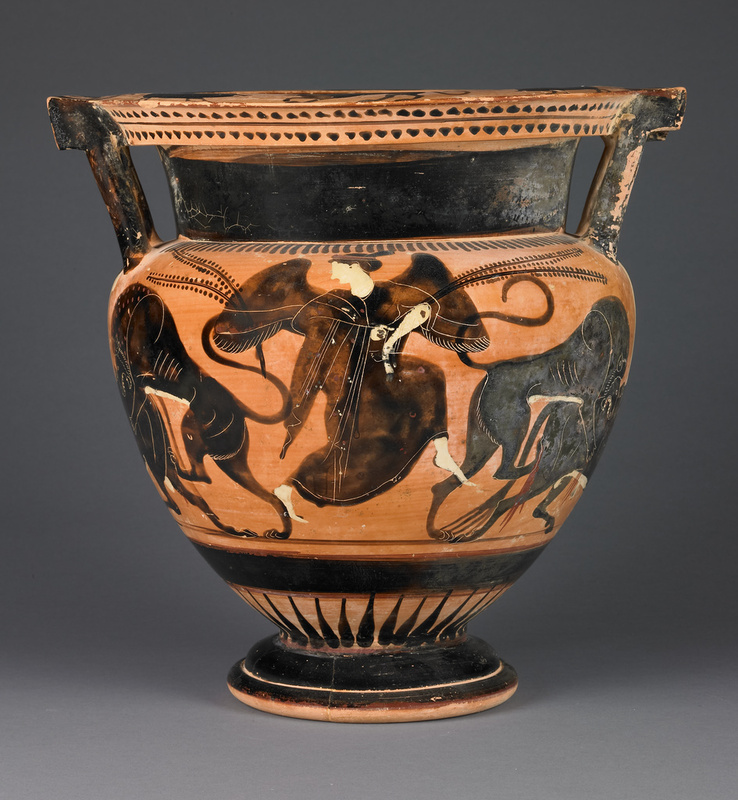 This Athenian black-figure column-krater depicts Odysseus bound under the ram, the leader of the flock. 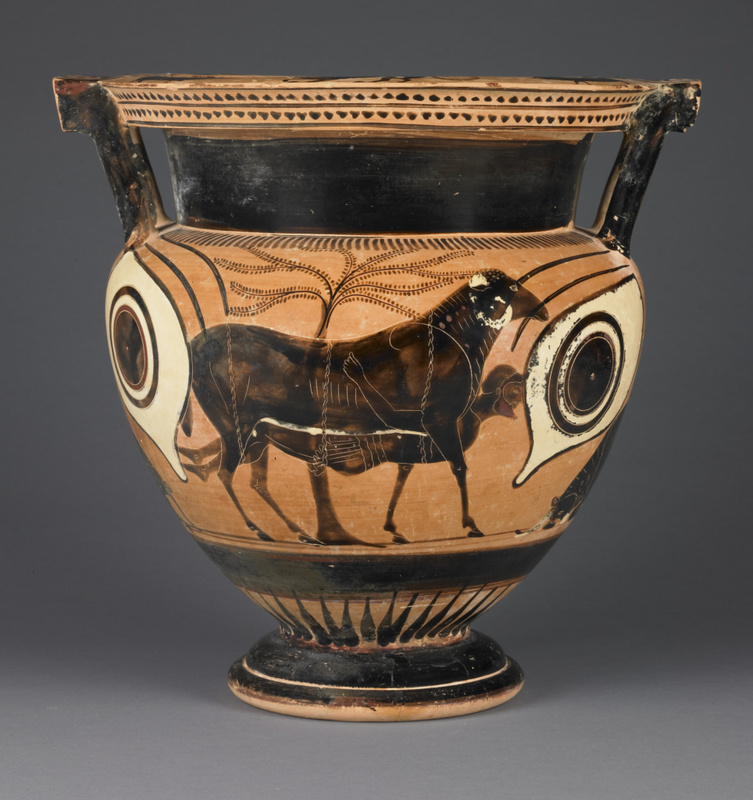 The scene is placed between a pair of eyes, which appear sporadically on Athenian vases of the 500s B.C. 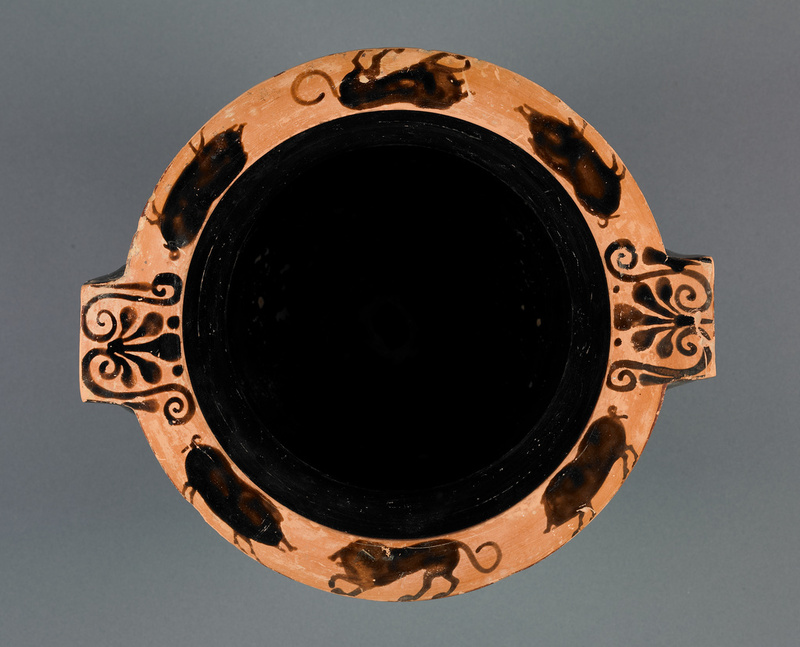 The escape from the Cyclops was the most popular scene from the Odyssey depicted on Athenian vases. 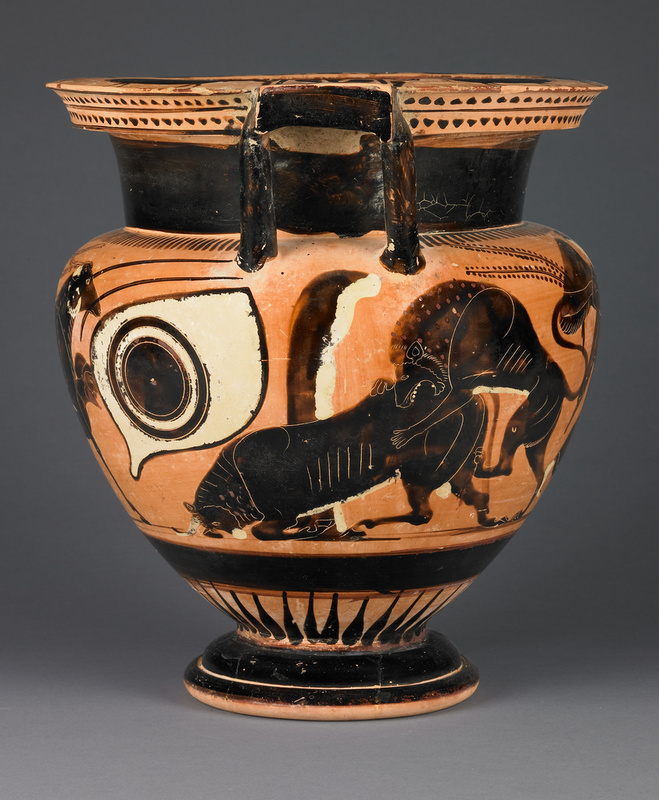 The back of the vase shows either Nike or Iris between scenes of lions attacking bulls. The Greeks produced a very strong wine, which they drank mixed with water. 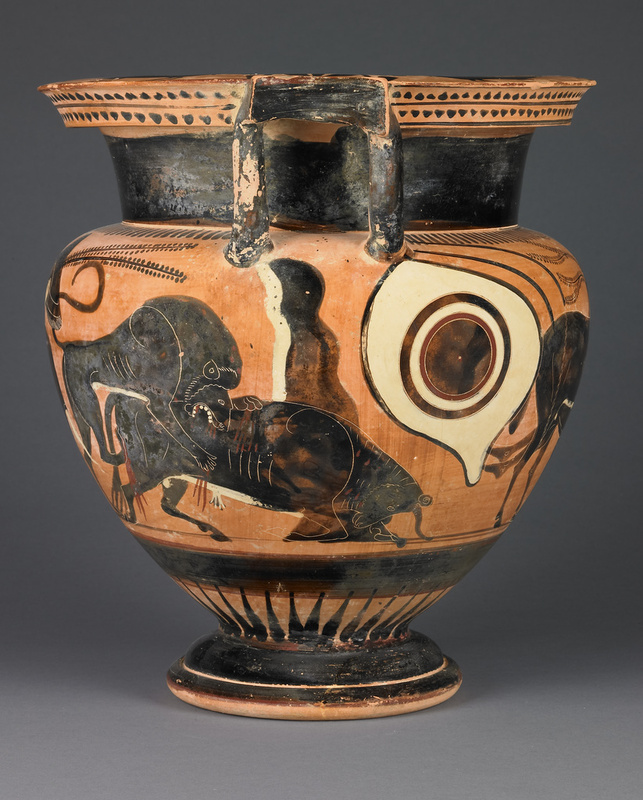 A krater was used as a mixing vessel to blend the wine and water before serving. The type of krater that scholars call a column-krater takes its name from the columnar appearance of the handle supports. True, Marion, and Kenneth Hamma, eds. A Passion For Antiquities. Ancient Art from the Collection of Barbara and Lawrence Fleischman, exh. cat. (Malibu: The J. Paul Getty Museum, 1994), p. 356, cat. no. 289. Andreae, Bernard, and Claudio Parisi Presicce, eds. Ulisse. Il mito e la memorie. Exh. cat., Palazzo delle Esposizioni, Rome, February 22-September 2, 1996. Rome: 1996, p. 132, no. 2.23 (color photo). "Museum Acquisitions Between July 1, 1996, and June 30, 1998." The Report of the J. Paul Getty Trust (1997-98), p. 68. Spivey, Nigel and Squire, Michael. Panorama of the Classical World (Los Angeles: Getty Publications, 2004), p. 125, fig. 208. Dietrich, Nikolaus. Figur ohne Raum? Bäume und Felsen in der attischen Vasenmalerei des 6. und 5. Jahrhunderts v.Chr. (Berlin: De Gruyter, 2010), pp. 94-5, fig. 73. Students will read a story from The Odyssey by the Greek poet Homer and write, illustrate and perform in response to elements of the story.